The art of cooking meats is to cook them to the right level of doneness, so that it’s tasty but tender. With an accuracy to 0.1°C and a magnetic info card with Heston’s recommended temperatures for guidance, the Instant Read Meat Thermometer is specifically designed to make sure that happens. 30 min before cooking, remove the cote de Boeuf from the fridge. For the mushroom spice rub, toast cardamom, black peppercorns and star anise in a hot, dry pan until fragrant. Remove and allow to cool slightly before grinding to a fine powder using a spice grinder or pestle and mortar along with the bay leaves. Combine this mixture with the smoked salt, garlic powder and cep powder. Set aside. Rub the grapeseed oil into the meat, followed by the mushroom spice rub, ensuring it is evenly coated. Heat a BBQ and place the Cote de Boeuf onto the grill once the coals are glowing white. 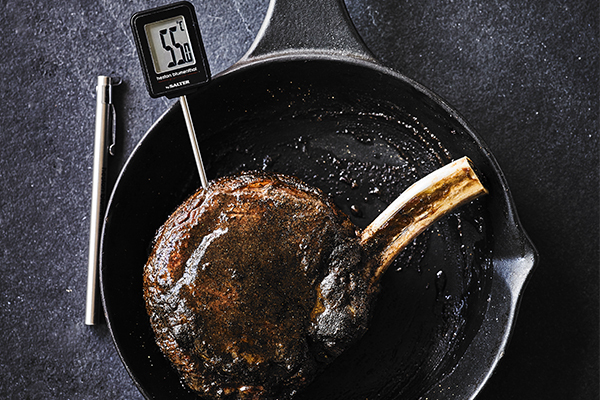 Flip the steak every 20 seconds until the centre reaches 48°C, approximately 6 to 8 minutes. Remove and rest for 5 minutes on a cooling rack placed over a tray.